Ambassador Dr. Riyad Insanally (center) and Deputy Chief of Mission Mrs. Lesley Dowridge-Collins (r.) present a plaque to Ms. June Sumner-Dublin (l.) in light of her 50 years of unbroken service to the Embassy. 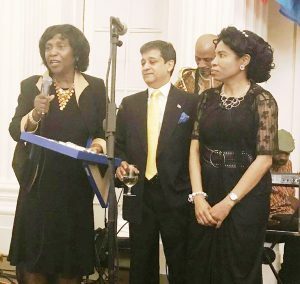 On Saturday, over 200 persons, including diplomats and members of the Guyanese Diaspora in the District of Columbia, Maryland and Virginia tri-state area, gathered in the Hall of the Americas at the Organization of American States to celebrate the 52nd Anniversary of the Co-operative Republic of Guyana. 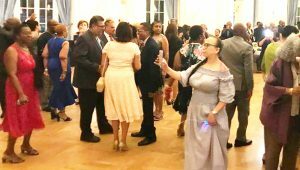 The reception was hosted by the Embassy of Guyana, the Ministry of Foreign Affairs said. Guyana’s Eighth Ambassador to the United States of America, Dr. Riyad Insanally, in his remarks, noted that Guyana-US relations are going from strength to strength. He welcomed US Secretary of State, Mike Pompeo’s strong Independence Day message of friendship and cooperation couched in unambiguous terms regarding recognition of Guyana’s territorial integrity. Attendees at the 52nd Independence celebrations in Washington DC. their elected congressional representatives of the importance of the US-Caribbean relationship, of building economic prosperity in the Caribbean, and of the enormous value the Caribbean Basin Economic Recovery Act brings to the region and the need to press for its renewal before it expires in September 2020. Turning to developments in Guyana, the Ambassador reminded the gathering that the Government of Guyana is working assiduously to ensure that the transition to being an oil and gas producing country is managed well and highlighted the ongoing work on initiatives such as the creation of a Sovereign Wealth Fund, the establishment of a Petroleum Commission, capacity building to optimize the benefits of the new industry, infrastructural development, and the pursuit of a Green State Development Strategy in order to pave the way for a sustainable future for all Guyanese.. Ambassador Insanally extended gratitude to all those who had contributed to the event, including the Master of Ceremonies, Cornel Ferdinand; Reverend Eion Greaves, who sang the National Anthems of the USA and Guyana; Peter Humphrey and the Oasis Island Sounds Inc., Imam Baksh, winner of his second CODE Burt Award for Young Adult Literature, who did a reading; and the staff of the Embassy of Guyana. A special award was made to June Sumner-Dublin, Executive Officer III, who this year marked 50 years of unbroken and exceptional service at the Embassy.